Rajasthan is witnessing an action that is unprecedented in the history of a democracy anywhere in this world. Rajasthan officials are enforcing a two-day statewide internet ban with arbitrary geographical boundaries. The reason for this being to deter cheating at the Rajasthan State Constable Examination. Administrators in each district had to pass orders to shut down cellular internet (and home broadband services too maybe) on this weekend from 9-5 8AM-5PM in the day [copy of order from Divisional Commissioner, Udaipur]. This is the first time something of this scale is happening but Rajasthan is no stranger to regional internet bans. We are being normalized for what is an extreme action. This time the reason for shutdown is to deter cheating at a government examination. Shutdown internet for the whole state to stop cheating at an exam, makes perfect sense. 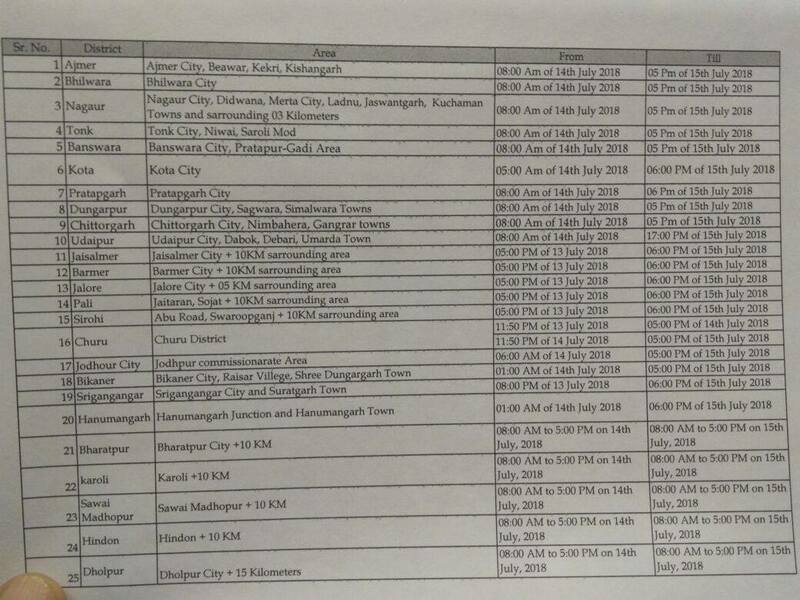 Folks at Software Freedom Law Centre (SFLC) have been tracking the Internet Shutdowns across India for last four years. According to InternetShutdowns.in, state of Rajasthan has seen 25 shutdowns in this duration which is second highest for any state in India after J&K! SFLC’s handbook on Internet Shutdowns in India is fairly useful policy primer on the issue. This will mean a loss of livelihood to many (cab drivers, mobile recharge shops, food delivery businesses, remote employees, freelancers, the list goes on). This directly negates the whole idea of digital india and the push to digital payment that came after demonetization. This is probably harmful in hundred more ways. None of these shutdowns are properly communicated. The government simply is not even interested to gauge in the economic and other losses as a result of these bans to a state of 6.89 Crore people! It is even more important that you make yourself heard because there is no framework or metric right now that the Office of District Magistrate or any official higher in the ladder uses to decide what events/occasions duly require a blanket ban (if any at all!). By not speaking you are surrendering your rights to access to internet which is equivalent only to letting the government decide when you get to be online and when not. I am not sure if you or your friends are directly affected but we still need to hold our administration accountable at this moment. Only because this is an immense power exercise! What is the process of arriving at the conclusion of such blanket ban? How are geographical boundaries in ban enforced? Who is enforcing these boundaries? What all exams in future will require a blanket ban? To put things in perspective, internet bans are used around the world even by authoritarian regimes only in dire needs and at times of revolt (think arab spring). We are a liberal democracy seeing this enforced so casually. This is normalization!